There is something distinctively delicious about my praise of Gordon Ramsay at The London pre-dating today's L.A. Times review by none other than my idol, S. Irene Virbila. Especially delicious is the fact that Virbila echoes my sentiment that the restaurant is the antithesis of Ramsay's television shows. 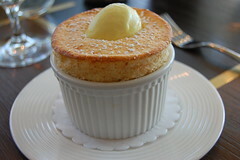 Like yours truly, Virbila is also in love with the risotto, the cod, and the pineapple souffle (which I described as "a wondrous tropical fluffy cloud in my mouth...[b]ursting with happiness," and she said was "blissfully light" and "high and proud"). The good news: You can trust me. 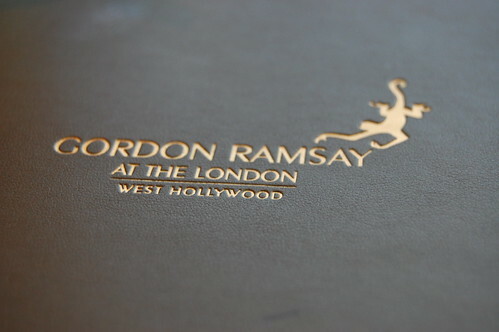 Gordon Ramsay really is worth a trip. The bad news: Reservations will now be harder to get after Virbila's thumbs up. i'm amused at you idolizing a food critic. Too bad I live in Omaha-effin-Nebraska. S. Irene ruins everything *pout* Maybe I can get in for a yummy midday lunch. I'm just going to call and tell them I know THE Weezermonkey. I'm sure they'll find me a seat ASAP. I prefer to eat vicariously through you anyway. in addition to all the people who said it in the comments on sunday's post, my mom also said you should be a food critic. i think it's so funny how people don't get the world of journalism. it's like saying you should be an astronaut. doesn't just happen. it's a whole career path. sigh.